A unique beer garden unlike any other in Wisconsin. Come celebrate with your friends, family, and neighbors at Croatian Park. Experience our own take to the Wisconsin beer garden tradition. The Croatian Park Beer Garden is open to the public and everyone is welcome. We will be open from 5:00PM – 10:00PM every Thursday from the Thursday before Memorial Day through the Thursday after Labor Day. 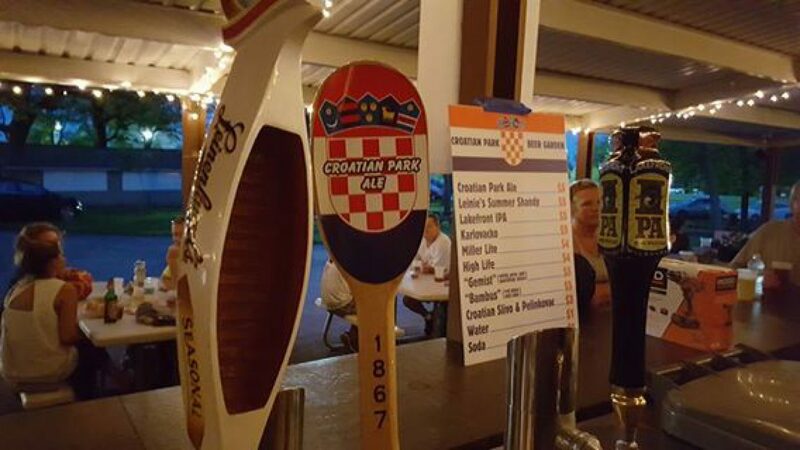 We feature our own craft beer called Croatian Park Ale, Karlovacko Pivo (and imported Croatian Beer), a rotating selection of Wisconsin & Croatian Craft Beers, and of course MillerCoors products. Croatian Cordials (SHOTS) are available as well as a selection of mixed drinks, wine, soda, and water. We offer an onsite ATM as a convenience for our guests as well as free WiFi internet access for those who want to work/play while enjoying a great beer. A game room is also offered with games such as ping pong, Foosball, etc for both kids and adults to enjoy. We also feature volleyball courts upon request and two full lighted Bocce ball courts which is always a popular nighttime game for our patrons. Also make sure to come hungry as we have a nice selection of grilled items such as Croatian Ćevapčići, our very own Croatian Nachos, and other food items.